I can’t do very much without causing increased pain levels but I do like to get some jobs done if I can, I have always been particularly fond of gardening and if I can I will sit on the lawn and do a little bit of weeding. But the big problem with any task, is that I quickly over heat, in fact I get so hot so fast and it gets so bad that I struggle to think straight. 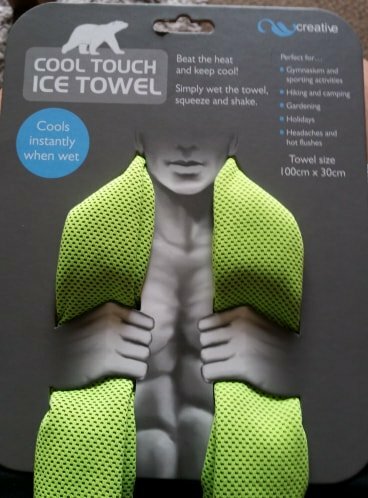 I went on a very rare trip out to a local garden centre as I wanted some Fox Gloves for the garden (obviously) and there I saw the Creative Products Ice Towel for sale and it seemed to be the perfect answer to my over heating problem. Today was sunny and I was keen to get in the garden and sort some of the pots out, they needed weeding and tidying up and a couple of bits repotting. So I put the Creative Products Ice Towel in the sink and wet it with cold water, rung it out and put it on bandana style. Yes I know it is a bit bright, but don’t worry they are also available in Blue, Red and Grey. I went for the bright option as I wouldn’t lose it when I put it down and yes that happens a lot! Of course you don’t have to go bandana style like I did, the towel is 100 x 30cm and can be worn around your neck or as a head band. I will keep it in my wheelchair bag ready to use, all you need is some cold water, ring it out, shake it for 5 to 10 seconds and it’s cool. The package said it will stay cool for over 2 hours and I was in direct sun in the garden for about 90 minutes and it kept me cool, I couldn’t have been out there that long previously and I did not over heat at all! This is perfect for taking to the gym, out on a bike ride and on holiday but if like me you suffer from chronic health, then this amazing product will make a massive difference.